Luxury Pools and Living was brought into the pool industry almost by accident. 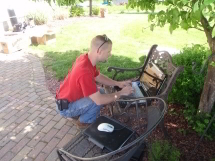 In late 2003 Matthew Ray, our founder, was hired to complete a home remodeling project for a client in Central Ohio. While his team completed the project they were asked to work with (at that time) the "BEST" local pool installer on the pool. It was during this project that it became clear to Matthew and his team that they could do it better - a lot better. The idea to start a pool company was born. The year 2005 was spent researching pool types and learning what was best and we began to build our offering. It was at this time we realized what a challenge the pool industry really was. Information was simply not available to learn about the types of pools or the pros and cons of them. Worse yet we found that the overwhelming majority of pool contractors were poorly educated on their own industry. Our mission became providing clients (and other pool installers) with the material and facts needed to educate themselves. This website was born. Office work from the field! The year 2006 was the beginning of "Leisure Pools of Columbus"’ and our first official season of installing pools. The remodeling business continued to grow and that diverse offering enabled us to work on projects that involved more complex components such as room additions or outdoor living spaces that incorporated a pool. Over that first season we learned, and in many ways developed best practice methodology. There are no minimum or recommended standards related to installing fiberglass pools and very few building codes. The installation process is extremely region specific and was a bit trial and error. 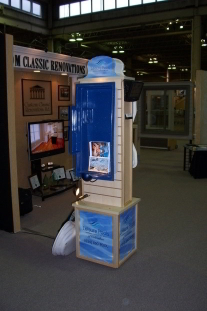 In 2007 we began transitioning from the home remodeling business to the pool industry. It seemed like an easy enough switch. Excavation, concrete, electrical, and of course plumbing were trades that would be applied to the pool business and for the most part the shift was smooth. We found as many pool installers have - the physical act of putting pools in wasn't hard, the problem was it was also easy to mess them up. "So you think installing a pool is easy"
By 2008 we had gained significant share in the market. Realizing how much superior fiberglass pools are for the majority of residential customers we made the decision to focus exclusively on fiberglass swimming pools. It was at this time we also shifted away from service and repair work related to other types of pools to concentrate on new construction and installation. The year 2009 was welcomed with the purchase of our current location on Shawnee Ave just off Interstate 71 in Columbus Ohio. It had formerly been a fence company and needed a little bit of TLC. In 2010 we completed our design studio and showroom along with a courtyard where clients can see different paver and concrete decking samples. 3D designing became an important part of our process and offering. It has enabled clients to see exactly what their project is going to look like before it starts. The year 2011 saw the start of our distribution business. Our volume had increased to a level that enabled us to bring in pools by the semi load and move them to individual jobs. This gave us a tremendous amount of control in terms of timing and transportation cost. With pools in our inventory we began to distribute to other dealers in the area. In just a couple fast years we were a bit tight on space so we had to get creative. The roof was all we had left. In 2012 despite our relative short time in the industry we became the official distribution yard for Leisure Pools USA in the Midwest, as well as the dealer trainer, and factory representative. This led to the development of our current distribution yard and delivery fleet. 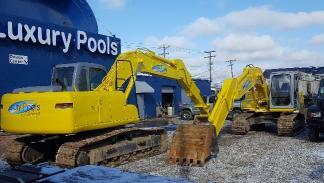 Located off Harmon Avenue the "Pool Yard" consists of five acres of pool inventory, our crane, and delivery vehicles. This yard not only gave us space for pools and equipment, it also gave us the space to pre plumb, wire, and jet our pools before we brought them out to the job site. 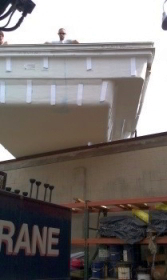 Being able to complete this work prior to the delivery greatly increased our efficacy and once again control our costs. In 2013 we experienced tremendous growth as did much of the economy. Resources such as dirt haulers, track hoe rentals, and gravel became more difficult to obtain. When we needed it to work so did similar construction industries. Due to increased demand and us competing with other industry such as natural gas fracking business in Eastern Ohio construction resources became almost impossible to schedule on the same day. In order to more effectively maintain control over the time, we found it necessary to own our own "iron". We purchased own our own track hoe excavator, a second and third loader, and a dump truck. These acquisitions enabled us to greatly increase our production capabilities, maintain control, as well as further control our costs. In addition to overcoming the shortage of construction equipment we also found ourselves short on pool inventory and access to product. It was at this time that our relationship with Barrier Reef Pools was forged. Though not a widely known company, Barrier Reef was quietly producing the absolute BEST fiberglass pools in the world and was able to produce our line of pools for us. The year 2014 again blessed us with growth and additional market share. We added equipment and staff through the year and ran out of space in our current location. As a result we found it necessary to purchase additional yard and buildings (formerly Wolf Creek Irrigation) just north of our current shop and office. Fall of 2015 we opened the production building and separated all admin and production team. Everyone was happy. Winter of 2015 / 2016 yielded a record number of pre-season contracts making it clear that we would need to again expand our equipment fleet. We purchased an additional track hoe and a designated tractor trailer to haul our equipment around on. Two excavators gave us the ability to cover more geographic area than ever before and the semi afforded us a level of control and flexibility we had only dreamed of.